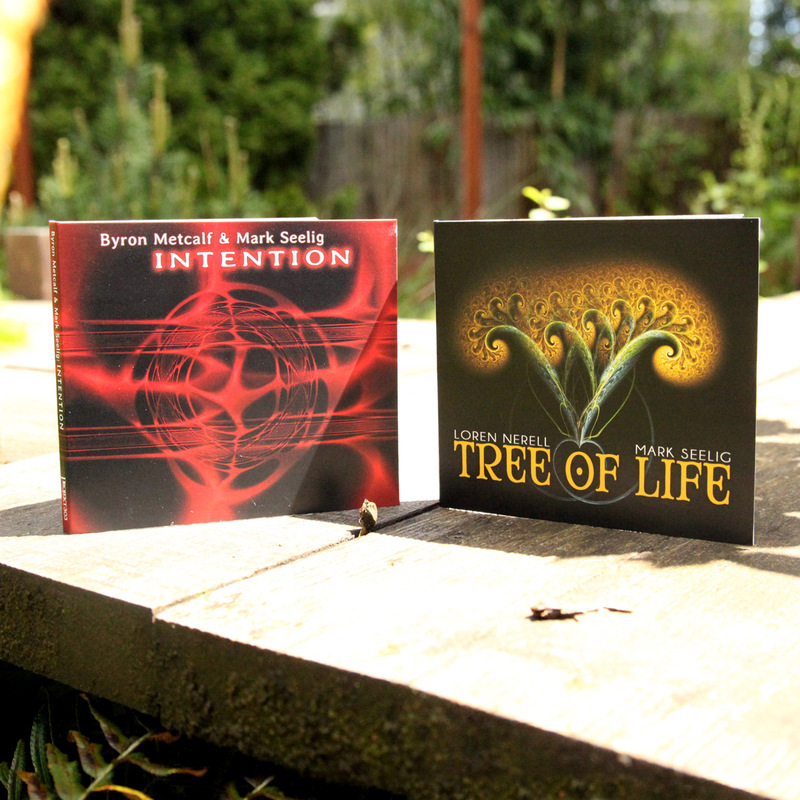 Tree of Life is a mesmerizing blend of ancient instruments, haunting voices, and whispers of Balinese and Indian wisdom traditions woven together with ambient field recordings. One part droney soundscape, one part tribal deliberation, and one part ethnological exploration, Tree of Life expands into a transformative experience. | Read the full description here. Intention is a transcultural tour de force of multi-layered tribal-ambient rhythms, indigenous instruments, and mesmerizing soundscape. Byron’s spellbinding and laser-like drums and percussion merge with Mark’s haunting and beautiful bansuri flutes and Tuvan-style throat singing to create a bold, larger-than-life journey into infinite possibilities. Infused with steadfast power and authority, Intention is expertly crafted to induce and support expanded states of consciousness. | Read the full description here. Both of these recordings take the listener on wide-ranging journeys through Southeast Asia, North and South America, Bali, and India. With vocalist Mark Seelig the common factor, the discs’ ambient-tribal soundworlds blend the modern and the ancient. Simply identifying him as a singer could be misconstrued to suggest singing of the conventional, lyrics-based sort; more correctly, Seelig’s vocalizing in these contexts is wordless chanting similar to the kind of singing one imagines has been with us since the dawn of humanity. Intention pairs Seelig’s Tuvan-style throat singing and Bansuri flutes with Byron Metcalf’s percussion arsenal: frame and ceremonial drums, hybrid toms, udu, and rattles. That statement alone goes a long way to conveying the particular soundworld presented on the five-track release, even if the duo welcomes guests into the fold, too. In that regard, Rob Thomas and Dashmesh Khalsa (didgeridoo), Daniel Hirtz (tabla), and Max Link (water pot udu) amplify the fundamental character of the terrain sketched by Seelig and Metcalf. This isn’t the first time the two have joined forces, by the way, with Intention preceded by Wachuma’s Wave (2003), Mantram (2004), and Nada Terma (2008), all of them created in collaboration with Steve Roach. The opening title track is representative of the tone and style of the whole, with Seelig’s deep-throated voice and aromatic flute interweaving with the low-pitched moan of Khalsa’s aboriginal didgeridoo and the insistent tribal rhythms of Metcalf’s hand drumming. Eschewing the conventions of songform, the settings present themselves as consciousness-altering dronescapes; adding to the recording’s hypnotic effect, each track flows into the next without pause, a move that creates the impression of the recording as a single, seventy-minute entity. The indexing isn’t handled randomly, however, as there are distinct changes in arrangement and tone that occur at the transition points; the onset of “Focus,” for instance, is clearly signified by the sudden appearance of percussive rattles. In contrast to the laconic pace of the opening piece and the closing “Vision,” “Surrender” is more rhythmically charged, powered as it is by energized percussive attack, while “Encounter” gradually escalates to a state of near-ecstasy. Seelig and Metcalf also hold the listener’s attention by making constant adjustments to the scenery, with the drums at certain moments either the only sound present or absent altogether and the spotlight alternating between Seelig’s voice and haunting flute playing. For Tree of Life, Seelig, this time credited with chants, flutes, and demung, teams up with Loren Nerell, who contributes samples, synths, and gamelan instruments to the project. Compared to Intention, the guests’ contributions are even more pivotal to Tree of Life as each of its six indexed tracks assumes a slightly different character due to the involvement of a particular guest (or two). German percussionist Max Link plays claypot and demung throughout, while Gabi Link (saron), Pankaj Mishra (sarangi), Kathrine Wright (voice), and Steve Roach (ocarina) appear on individual settings. Understandably, the presence of Balinese percussion and instruments associated with Indian music gives the recording a distinctive and defining character, and once again the indexing is effective in identifying significant changes in sound design that occur as the recording progresses. “Wacah Chan” begins with field recordings sounds suggestive of exotic forests or jungles, after which Seelig’s chanting voice and flute musings and Roach’s softly whistling ocarina appear. With regulated rhythms absent, the material takes on a sleepy quality, as if the elements are only beginning to awake from a trance, until “Cintamani” arrives to augment Seelig’s ruminative flute playing with lilting percussive patterns that, in turn, grow more robust, funkier even, within “Yggdrasil.” Details and layers are added incrementally, and the music unfolds patiently until a brief arrestation announces the arrival of the dream-like “Kayon” featuring Wright’s vocalizing, both ethereal and supplicating, and the chiming see-saw patterns of Link’s saron, an Indonesian gamelan instrument. The recording’s arguable highlight emerges when Indian maestro Pankaj Mishra elevates “Acacia” with the human-like cry of his sarangi playing. Though both recordings amply repay one’s time and attention, Tree of Life generates to a slightly greater degree than Intention the impression of a long journey filled with divergent episodes and scenery changes.